During Brain Awareness Week, we celebrate the brain’s limitless ability, recognize achievements in brain health research, and raise awareness for cognitive disorders. Six in 10 Canadians aged 65 and above reported having short-term memory issues in the past year. You may not be surprised that cognitive concerns are so common – but have you ever wondered why they occur? According to BrainFacts.org, “as we age, connections between brain cells weaken and cells can’t communicate with each other as effectively, leading to problems with memory and cognitive ability.” There are plenty of fun, challenging ways to exercise your brain and help fend off cognitive decline. Here are some recommendations for entertaining activities to improve cognitive function. We all know how relaxing and soothing music can be, but did you know that music can help seniors maintain brain health? Music has been proven to encourage stress relief, improve memory, and even decrease pain. Or, enjoy music in a social setting by joining a local choir. The benefits of music can also be felt simply by singing along to a favourite song or tuning in to the radio to fill your home with music’s healing sound. Try learning to play a new instrument – learning a new skill can improve cognitive function and keep your brain sharp. Keeping your hands busy as you age may help slow the onset of dementia. Take up gardening, knitting, crocheting, or another crafty hobby to maintain motor skills and stave off cognitive decline. Try building or sculpting something simple with clay or wood, or take a painting class. Working with your hands will help maintain fine motor skills, keep you entertained, and encourage brain health. Did you know that light exercise for seniors can improve chronic illnesses, increase longevity and improve mental health? Try engaging in routine-based activities to enjoy these health benefits while also keeping your brain sharp. Follow these six easy exercises, for a simple workout for your body and mind. Learn a low-impact yoga flow, and teach it to your grandkids and loved ones so everyone can join in. Memorize some simple dance moves and choreograph a routine to your favourite song. Getting creative with exercise can have a dramatic effect on your physical and cognitive health – all while you have a little bit of fun at home. Word games like crosswords and word searches help give you a mental workout by challenging your recall abilities. The internet is host to a whole world of online word games where you can spell, unscramble, and speed read your way to improved cognitive function. 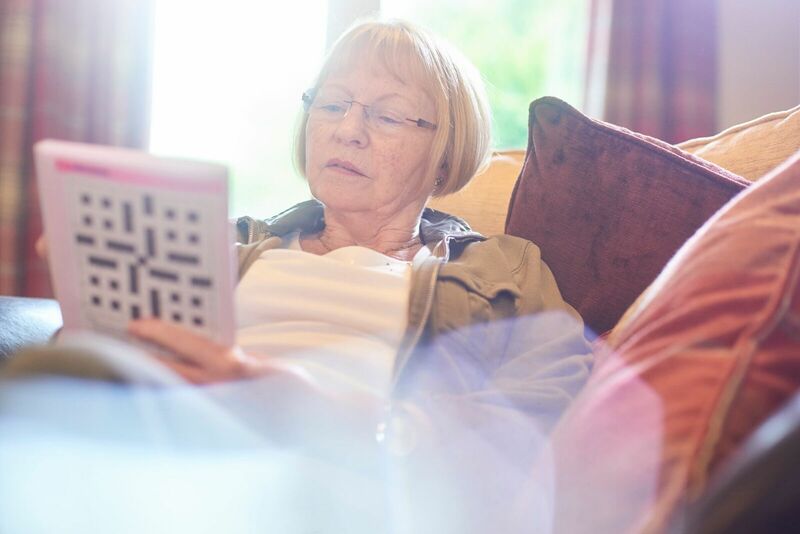 If a tangible game is more your style, pick up a crossword book at the grocery or drug store, or kick off a Scrabble tournament with friends or loved ones. Word games are a fun, challenging way to stay cognitively healthy. In the modern digital age, the possibilities for brain-building activities are endless –use your computer and browse a wealth of entertaining games to help improve memory, speed up cognitive function and heighten recall abilities. If you use an iPad, open up the app store and download some of the top-rated brainteaser apps like Lumosity, Word Brain, Fit Brain Trainer and more. Or, consider getting a gaming console to take your brain fitness to another level – studies suggest 3D platform video games can stave off cognitive impairment. In addition to a well-balanced diet, low-impact exercise and a good night’s sleep, help keep your brain healthy. If the stresses of life at home are preventing you from living freely as you age, our Bayshore caregivers can help. Call Bayshore today at 1-877-289-3997 to learn how empowering it can be to age comfortably in place.